When James VI King of Scotland succeeded his distant relative Elizabeth I Tudor Queen of England and Ireland in 1603 the British Isles had one monarch. The name was changed to the United Kingdom of Great Britain in 1707 and the United Kingdom of Great Britain and Ireland in 1801. 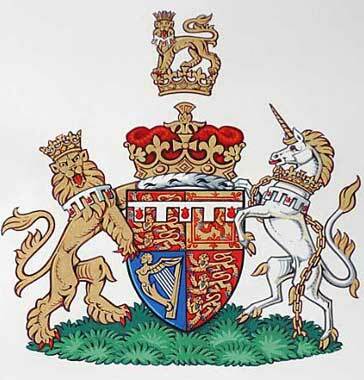 After the independence of the major part of Ireland in 1922 as the Irish Free State (republic since 1937) the name was (officially in 1927) changed to the United Kingdom of Great Britain and Northern Ireland. The royal title Duke of Sussex was created on 24-11-1801 for Augustus Frederick Prince of Great Britain and Ireland (1773-1843), and got extinct at his death. The title has been given for a second time on 19-5-2018 to Harry Prince of Great Britain and Northern Ireland. 72. Albert Edward VII King of Great Britain and Ireland, Emperor of India * Buckingham Palace 9-11-1841 + Buckingham Palace 6-5-1910; Son of Albert Prince of Saxe-Coburg and Gotha and Victoria Queen of G. B. and I., Empress of I. 103. Mary Ann Short * Garnsbro, Lincolnshire 30-10-1835 + 28-7-1907; Dr van Thomas S.